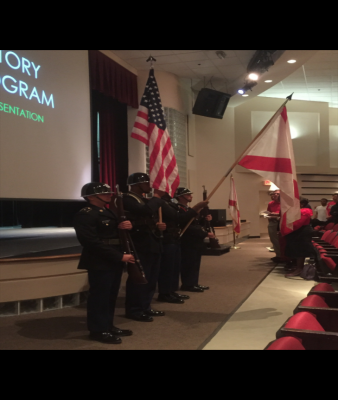 The Port Saint Lucie High School JROTC cadets were excited to present the colors and be part of the Black History month program at Port Saint Lucie High School. Cadet Sergeant First Class De’vonte Cousar led the Color Guard presenting the national flag, Cadet Commander Sergeant Major Damilola Joloagun presented the state flag, and standing as the guards were Cadet Major Dallas Reyes and Cadet Staff Sergeant Marco Nader. The Color Guard marched in honor to recognize the central role of Black Americans in U.S. history. Soon after the ceremony was followed by a presentation and a guest speaker, Michael Hill. We look forward to doing a Color Guard for the event again next year.